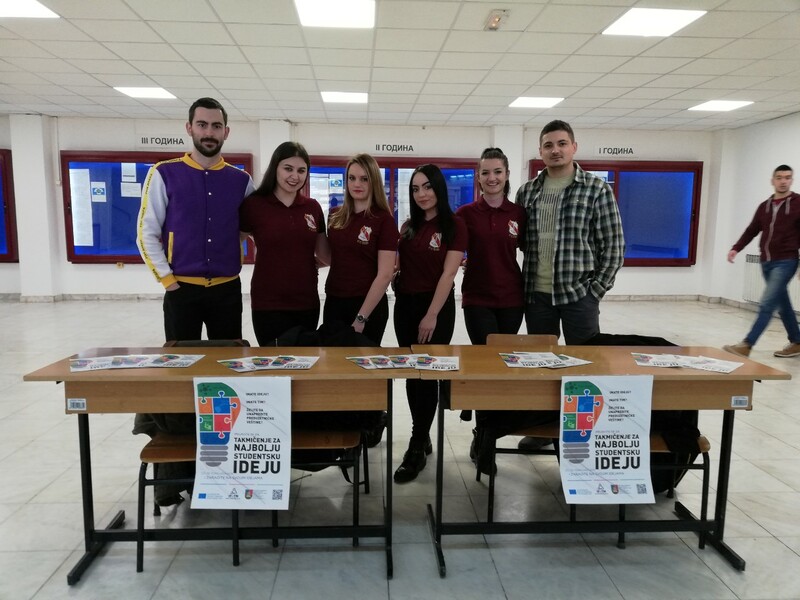 Promotion of the Competition for the best student idea was held on January 25, 2018. in the Creative Center of the University. 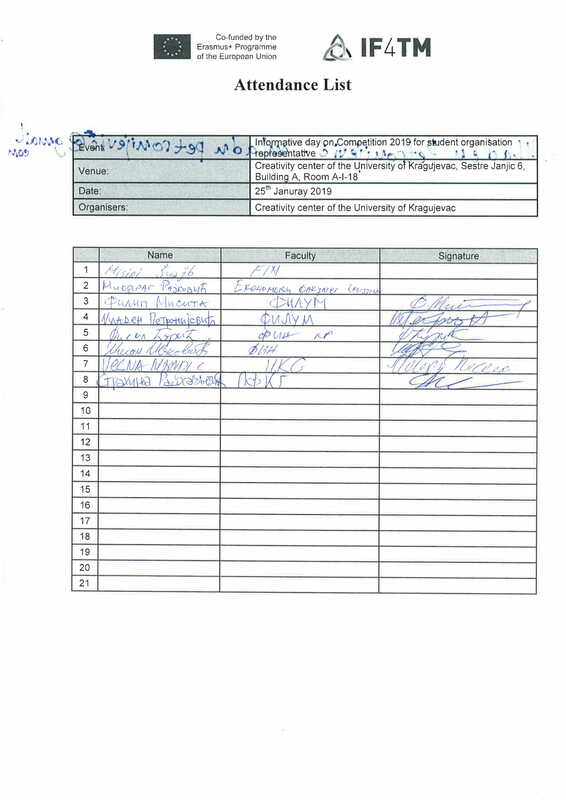 On that occasion, the meeting was attended by student representatives from the faculty of the University of Kragujevac. 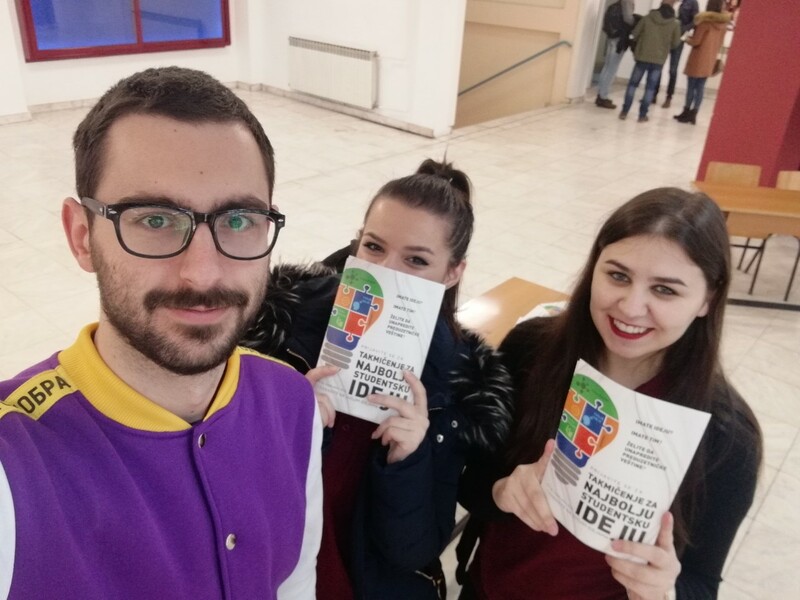 Through the presentation, students are introduced to the possibilities, rules, and activities of the competition, as well as the previous work and the existence of the competition. During the interactive presentation, students shared their experience from previous competition and expressed their desire to join promotional and applying activities on the competition with their teams. Equipment of the University’s Creative Center has been also shown to the students, that equipment will be available to the participants in the competition for the creation and development of the innovative ideas. A large number of interested students visited the stands of the competition and on that occasion they were additionally informed about the ways of submitting the idea, about the requirement that the team should achieve and about the time period of the competition. 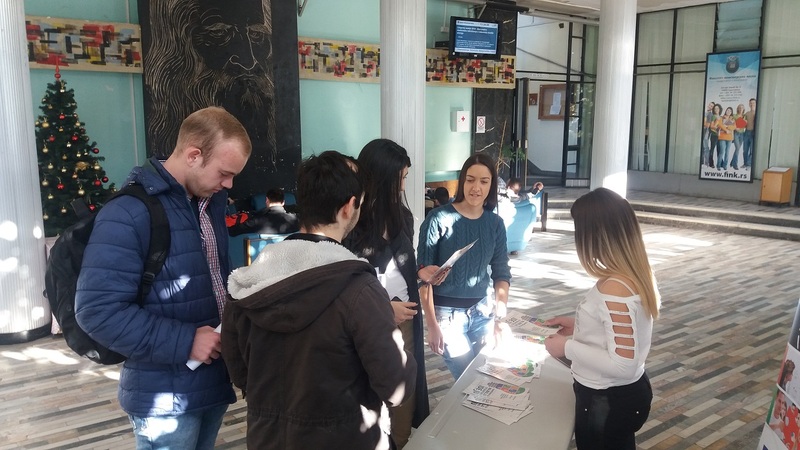 Students also became acquainted with the rules of the competition and the opportunities offered through trainings in the field of business model development, writing business plans, market research, founding start-up companies, etc. 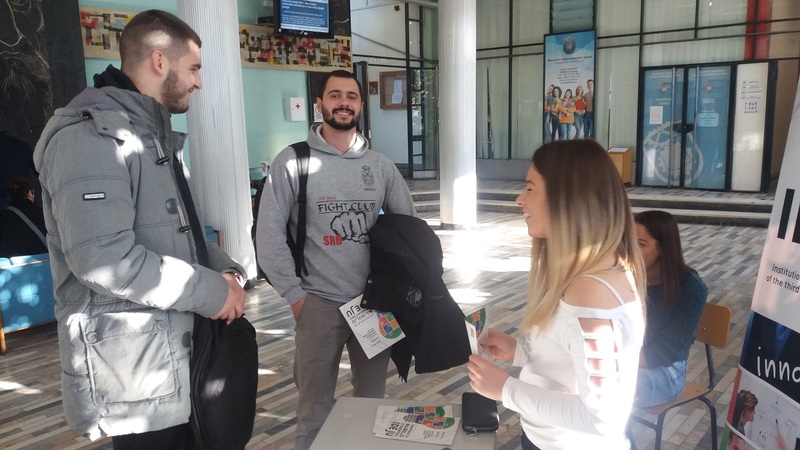 Students are also acquainted with the activities of the Creative Center of the University of Kragujevac in which they can develope they ideas jointly with other team members, mentors and theachers. 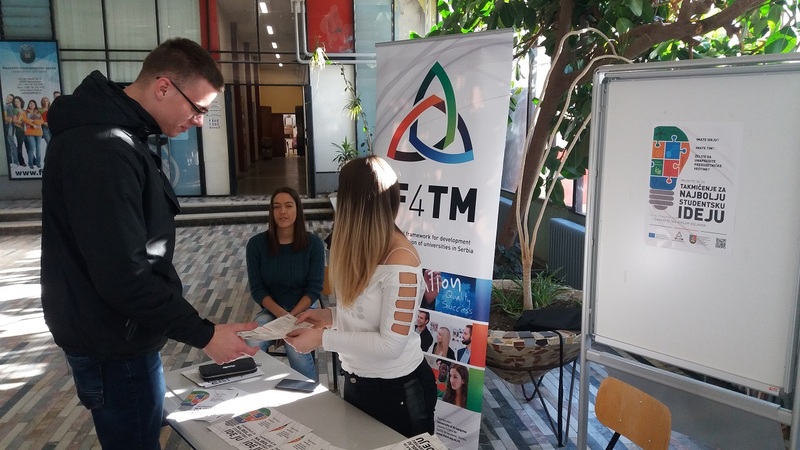 The Competition for Best Student Ideas has been launched within IF4TM project, coordinated by the University of Kragujevac and funded by the European Commission within Erasmus+ program. 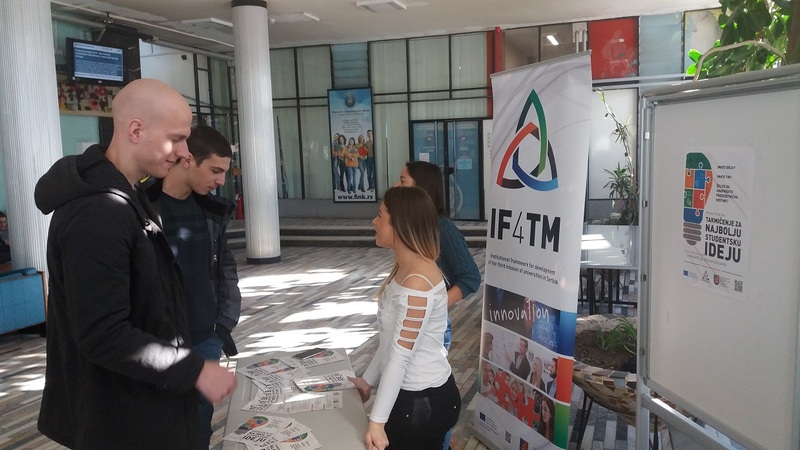 The Competition is realized in partnership with 17 partners from six countries through seven local competitions in Kragujevac, Belgrade, Novi Sad, Nis, Novi Pazar and Zrenjanin and National Final Competition to be held in one of these cities. 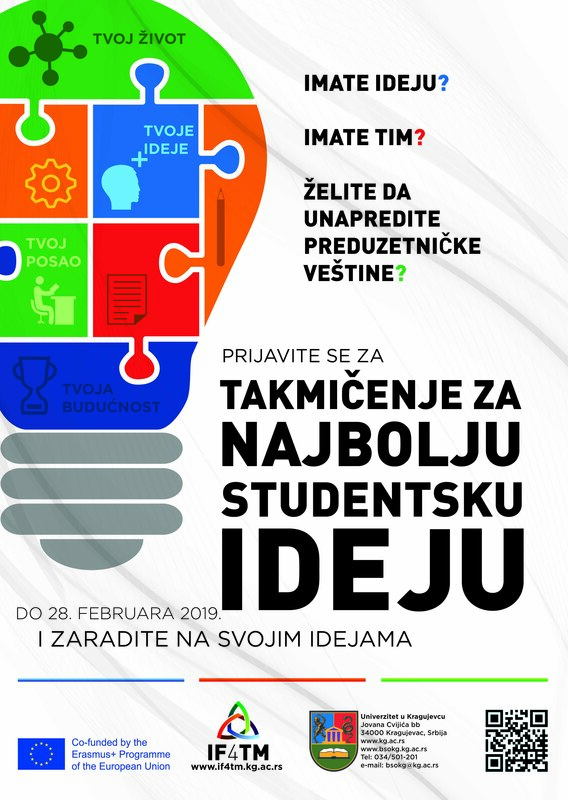 Students of bachelor, master and PhD studies of University of Kragujevac, University of Belgrade, University of Novi Sad, University of Nis, State University of Novi Pazar, Belgrade Metropolitan University and Technical College of Applied Sciences in Zrenjanin are eligible to participate. 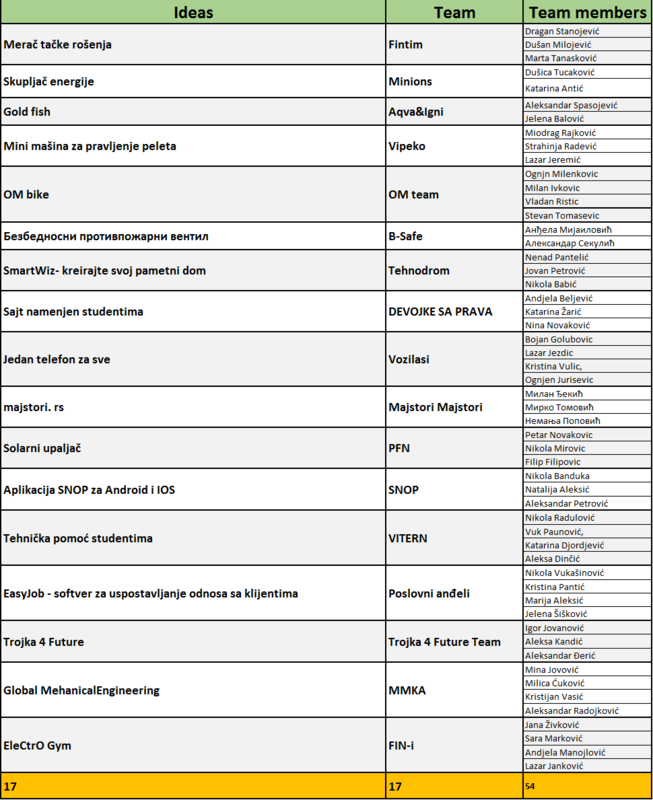 The teams from University of Kragujevac consisting of 2-4 members can apply with their ideas from 10th January to 28th February 2019, by sending the filled in Application Form to email address bsokg@kg.ac.rs. Additional information can be found at the project website www.if4tm.kg.ac.rs and the FB page www.facebook.com/takmicenje. Two best teams from each local competition will participate at National Final Competition to be held in June 2019. For more information and additional assistance, participants can contact Business Support Office via email address bsokg@kg.ac.rs.